Oak Knoll at Bonita Bay in Bonita Springs, Florida. Oak Knoll at Bonita Bay is unique to many single family luxury neighborhoods of Bonita Springs. Oak Knoll is a mere thirty three estate home sites on a curving street lined with mature oak and pine trees. Eleven of the home Oak Knoll home sites border the Imperial River and offer private, deeded boat docks and gulf access. 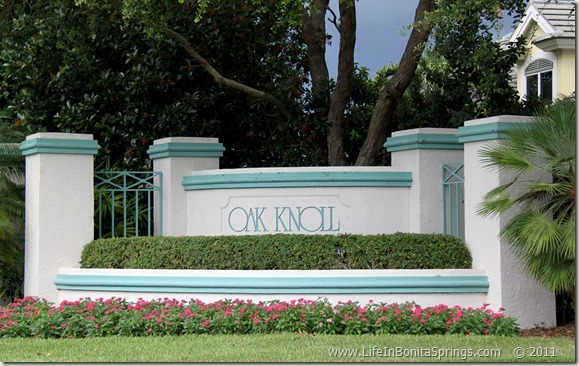 Home owners at Oak Knoll of Bonita Bay enjoy the option of their own private swimming pool or elect to have on installed in the future.Homes at Oak Knoll were constructed over a few years starting in the early 1990’s. Homes sizes vary from the mid three thousand square foot of living space and up. Oak Knoll, Marina Pointe, Hidden Harbor, and Riverwalk of Bonita Bay offer the only single family, waterfront, gulf access home sites in Bonita Springs located within a gated country club community. These parcels of real estate are extremely rare and coveted. For those who enjoy the best of both worlds, exclusive golf and boating from your own private boat dock on the Imperial River, Oak Knoll at Bonita Bay is the ultimate choice for home ownership.